Hip hop artist and community organizer Kamau talks tolerance, consciousness, and why sometimes a song needs more than one video. A lot of people really like Ian Kamau—so much that they’ll change their Facebook profile photo for him. It was early last week that I noticed the tiny pink-and-black swatches on my feed: digital declarations of support for the musician, visual artist and community organizer, and his new debut LP One Day Soon. 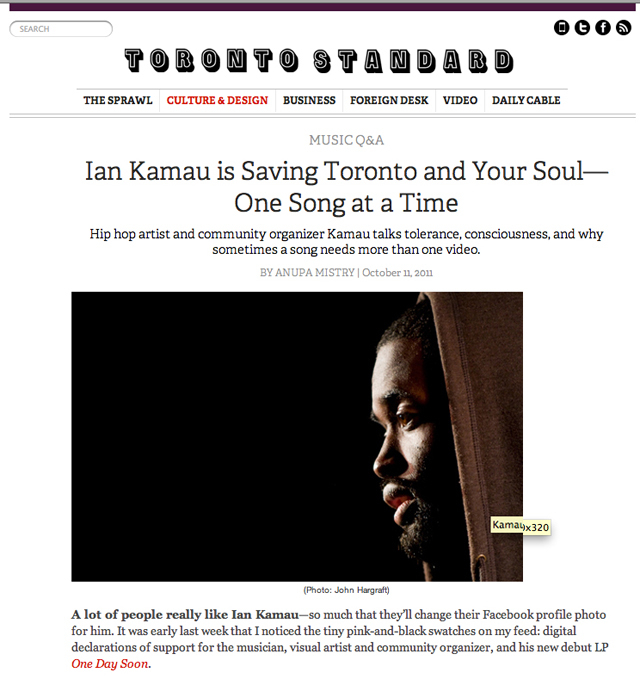 Kamau is a fixture in Toronto’s hip-hop scene: since 2003, he’s sporadically released music as a solo artist and Pangaea Project member, and in the mid-’00s toured Canada and Europe with k-os. But it’s an affinity for unique, personal connections that have mobilized an outpouring for the truly independent artist. For seven years, since 16, Kamau headed up the Graffiti Transformation Project at Scadding Court Community Centre, teaching art and painting murals with young people in Alexander Park. Since then, he’s been involved in various arts-based community projects throughout the city—most recently at Davenport Perth Neighbourhood Centre—with a brief sojourn to complete a fine arts degree at York University and Sheridan College and launch a design company. A firm faith in his own artistry and travels to places like São Paolo, Johannesburg, and Nairobi are what largely inspired One Day Soon, a disc resonant with personal narratives delivered in Kamau’s brimming tenor. But it’s also dedicated to the spirit of the young people he’s spent time with: “Young people are what you were,” explains Kamau. “And there’s no reason why you shouldn’t continue to be that.” I needed a reminder of Toronto The Good, so I talked with Kamau about how community can foment change. You can buy One Day Soon here. The videos you’ve just released for your cover of City and Colour’s “The Girl” are quite moving. Why did you create different videos for the same song? That song was on a mixtape I put out last year called Vol. 3: Love and Other Struggles, which explored the idea that love in whatever it’s forms is difficult. Usually when people say ‘love’ I feel like they’re talking about romantic love between a man and a woman. But within romantic love there are different forms, or there is the love between parents, or parents and their children. And then there’s also this idea of people seeing others fight for things, and not recognizing that that anger comes from love. So if you’re frustrated with society because it doesn’t treat people in a certain way, fundamentally, it’s about your care and concern for those people. I did community work because I love my community; I love black people. People fight pretty revolutionary struggles out of love. Looking at the second video for “The Girl,” I’m wondering how far does your frustration with discrimination reach? Was it a process to get to that point? Yeah, it frustrates me to see racism or sexism or homophobia. I’ve learned that a lot of those things are personal relationships: it’s much easier to say something negative about a group of people when you’ve never had to understand the complexities of their situations or why they do or think certain things. I haven’t always been open about the LGBT community—certainly not when I was in high school. For me, it took conversations with people who weren’t part of that community and then conversations with people who were, and not even about sexuality or gender. But my parents are very socially conscious and if you come out of that situation and fundamentally believe in, let’s say, freedom, you can’t believe in freedom for people of colour and not believe in freedom for women or the LGBT community. Freedom is not about agreeing. I’m really interested in the impact your parents, who are documentary filmmakers, had on your consciousness. I remember my parents used to take me to things. They would be involved in anti-apartheid organizing and I remember being in the audience with my mother the first time Nelson Mandela came to Canada. They made documentaries predominately about the different issues, neighbourhoods and black Caribbean communities in Toronto in the 1980s. And above all, that taught me about thinking, knowing and understanding different stories. I know a lot of people whose parents came to Canada in the ’60s and ’70s that tell them, “We did this for you.” Their dream wasn’t necessarily anything except wanting a better life for their children. My parents wanted to tell stories about the people that were around them and in their community. This meant there were other things they didn’t have: years in, like, a government job means you probably have a house. Well, my parents don’t. It was a different understanding of what value is. There’s value in money, but there’s value in what these stories can provide society. What’s more important to you: Art or community? Art and community aren’t two different things. I know some artists say they make art for themselves and I do enjoy the process of making music, even if no one hears it. But to be an artist is fundamentally about communication, you know? If I’m saying something, I don’t expect it to go into the world and that’s the end of it. Music or visual arts or film are the beginning of a conversation and that is a community development sort of thing. For example, the videos for “The Girl” will hopefully inspire conversations, and hopefully in places where those kinds of conversations might not be happening. There was a change when I started speaking more about myself, and individual things. It went from people messaging me or, after shows, being like ‘That was good,’ to people coming up to me after shows and either saying thanks or telling me stories, which happened more than anything else. Sometimes those stories would end in me knowing a person, and now they’re someone I see on the regular, and some stories ended with people crying. What’d you hear from the young people you were working with? I don’t know! You’d have to talk to them! That’s like saying black people, or women, are talking about whatever. The specific young people I was working with were interested in singing or spoken word poetry or photography or graphic design. They wanted to express themselves in that way but didn’t have an outlet so they came into this program with that in mind. But also, they are full human beings and were dealing with all sorts of stuff, positive and negative stuff, surrounding family, school and their personal lives at the same time. They are navigating their way through life like the rest of us. That reminded me you could do art or make music just because you like to do it, not because you’re trying to get to some place or be rich and famous. For them, at that point, to be able to get up in front of their peers, say their opinion and be praised for that was what they wanted. And that’s a lot of what I wanted—to get up in front of my peers and say something, whether people agree or especially when they disagree and you have a dialogue—that’s the fundamental building of community and relationships between people.